Put proposed and current negotiations into writing before reaching a final agreement. A LOI is, generally, not binding on the parties, but a MOU is a kind of LOI with some binding provisions. This LOI MOU provides some level of assurance to the parties of reaching a final agreement without having to relive every detail. Double-click on the image to enlarge and minimize. Use the buttons below to zoom on the image. Valid in all 50 States and Washington, D.C.
A letter of intent, generally, is exactly that, a letter. As a letter, it is only signed by the person who sends it, and, therefore, is not a binding on both parties because of the lacking signatures (it may, however, be binding on the party that sent the letter). The primary use of a letter of intent is to show one parties seriousness of wanting to enter into further negotiations and possible enter into a contract. A memorandum of understanding, generally, is a kind of a meeting of the minds, but without all of the binding aspects of a contract. The memorandum of understanding puts the intent of the parties into a writing that does not bind either party to the terms they do not want to be bound by allowing the parties to specify which terms are not binding and which terms are not binding. Why would anyone want to enter into a binding/non-binding contract? Because it lets the parties put into writing what has already been discussed and agreed on while still allowing the parties to change their minds on other points. The writing allows the parties to move the chains in the negotiations. 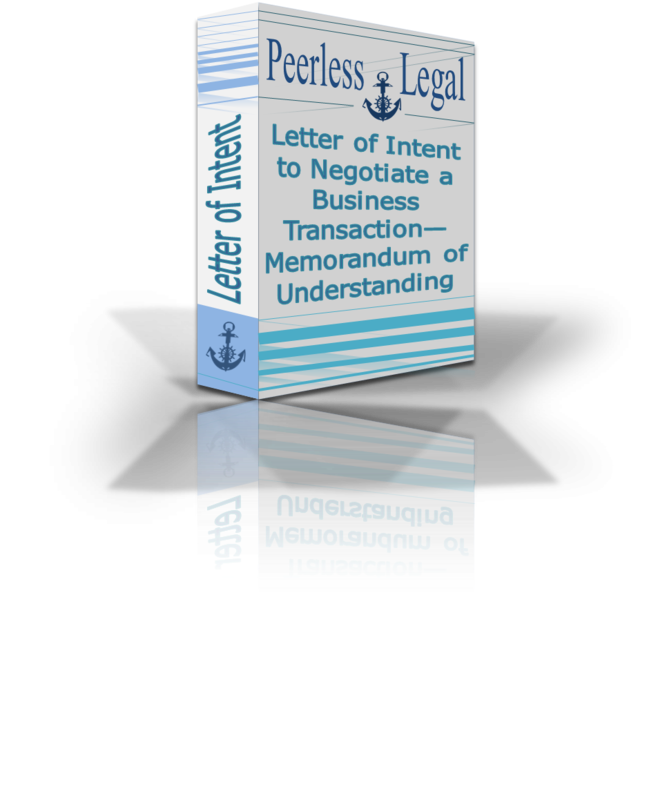 In this packet is an Executive Summary which details background information on the letter of intent to negotiate a business transaction--memorandum of understanding. The Checklist provides a way to check what needs to be completed in entering into this kind of a contract. The Walkthrough Instructions provides extensive details as to all of the parts of the Sample form. The Sample form is fully customizable and fillable. Any questions regarding a space or clause of the Sample form may be answered in the Walkthrough Instructions. The packet comes in Adobe PDF, Microsoft Word, and Rich Text formats. Below are common questions, with answers. Generally, a letter of intent (sometimes referred to as an LOI) is sent by one party to the other party as a memo of what has previously been discussed. The discussion can be about anything, including the possibility of purchasing goods, services, or the intent to enter into negotiations. It does not necessarily have to be written as a formal letter. A letter of intent is a preliminary document. What is a letter of intent to negotiate a business transaction? A letter of intent to negotiate a business transaction is used between businesses, individuals, and/or groups to put into writing their intentions, thus far, for one party to buy and the other party to sell a particular item. The key is the expression of interest to want to negotiate further. Simply, it means that a letter of intent to negotiate a business transaction puts into writing a party's seriousness about wanting to enter into negotiations and provides a recollection writing of terms discussed that can be used later to create a final agreement for the purchase and sale of the item(s). The item does not necessarily have to be tied with a business operation. Generally, a letter of intent (including the letter of intent to negotiate a business transaction) is sent by one party to the other with only a signature of one of the parties; therefore, the letter of intent is, generally, not legally binding. The memorandum of understanding (sometimes referred to as an MOU) is a kind of letter of intent that overcomes this one-sided issue by the parties coming to an agreement of what has already been discussed, but with only parts of the memorandum of understanding being binding. That is, only parts of a memorandum of understanding may be enforceable under state laws because the parties agreed in that way because it is a preliminary document. A memorandum of understanding is more formalized than the general letter of intent because both parties come to an agreement as to what has already been negotiated, put it into writing, and both parties sign it. This provides reliability because it requires more. This increased reliability in the memorandum of understanding can shorten the time it takes to reach a final agreement by avoiding duplicate discussions and providing pre-written terms. The hallmark of the memorandum of understanding is helping to move along negotiations while highlighting points needing more attention. What is the benefit of using a letter of intent to negotiate a business transaction--memorandum of understanding? A letter of intent to negotiate a business transaction--memorandum of understanding is useful when parties have not finalized all of the details of a potential transaction, but still wish to put their discussions and agreements, so far, into writing. This is especially useful when juggling multiple negotiations, when there is a large span of time where memories are less reliable about the detail of what has already been discussed, or when the parties want to see something in writing. Creating a record of the negotiations can reduce time and cost in the overall transaction by avoiding multiple negotiations on already agreed on points. Is this Letter of Intent to Negotiate a Business Transaction--Memorandum of Understanding a legal document? Is it legal? Parts of it may be legal and parts are not legal. That is the design of the document. The parties can decide which provisions to make binding, such as parts acting in good faith, while agree to not hold other parts binding, but included to provide a more formal writing to make the final agreement process more smooth. To make parts of it legal, the parties should complete the Sample and the parties should sign and date the document. Why use this Letter of Intent to Negotiate a Business Transaction--Memorandum of Understanding? This packet includes a Sample Letter of Intent to Negotiate a Business Transaction--Memorandum of Understanding, which is meant to provide some reliability in the negotiation process of a transaction. This packet's eform makes the process of laying out what has already been negotiated easier by providing common information and other information you may not have thought of or realize might be important to include. Avoid writing your own forms from scratch or using old free forms that can be incomplete and written by non-attorneys. Express your rights. Gain peace of mind without spending a fortune. Total number of pages in this packet: 17. Formats include Adobe PDF, Microsoft Word, and Rich Text. No physical copy is included. Copies can be edited and printed. Purchasers of this material are granted a license to use the contents for their own use. By purchasing this material, you will be purchasing a limited license to use all forms for your own use. The license is not transferable to third parties. The license limits you to personal use only and all other copyright laws must be adhered to, but no claim is made to any government forms that maybe reproduced herein.